The only thing that we need to watch to understand whether the inflation trade will make an attempt is the Dollar. 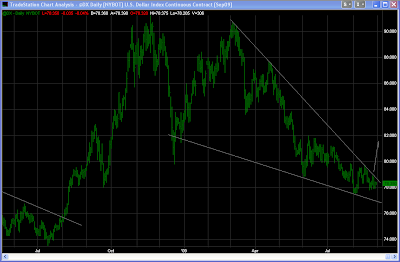 If the dollar breaks out of this diagonal...the its decline is over. Gold will roll over and the market in my opinion will be in a confirmed bear market move that will make wave 1 down looks mild. Clearly tomorrow is an important day. Even though the Gold chart has a nice triangle which I am not going to focus on in this post...Gold could breakout and fail after a few days. However, if the dollar rallies, the 5 waves down will be confirmed...which is a much stronger pattern than a triangle. Therefore, 78.60 on the DXU09 contract is the key level. For the DXY index its around 78.53. If we take out those levels decisively, considerations for hindenburg omens, inflation trades and the potential Gold breakout will be minor impacts on the overall trend in the markets which will be deflationary. Dollar breakout = next leg of deflation and the playing out of the Dollar Short Squeeze that I have been describing in my previous posts.